Friendly artillery raked the small village ahead, but the Marines were still under heavy machine gun fire while rocket propelled grenades rained down on them in an unending stream. For the third time in as many days, a Marine rifle company was being surrounded–but Captain James E. Livingston of E Company, 2nd Battalion, 4th Marines, still had 35 Marines left in his unit and was not going to stand for that. 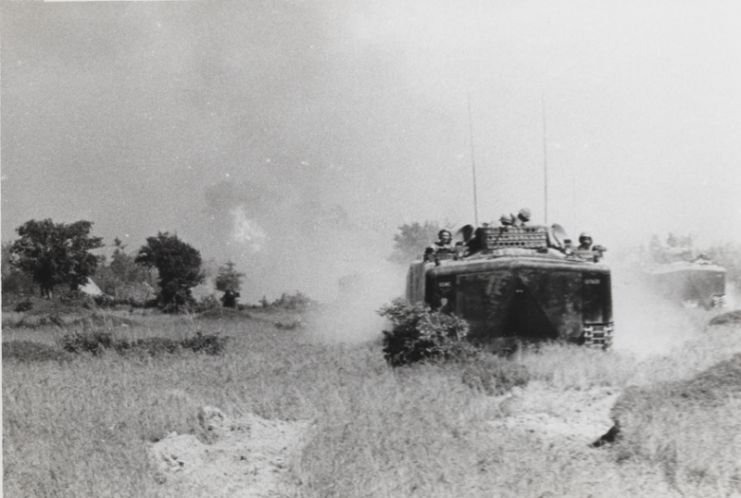 Livingston pushed his Marines and those of Company H to victory…until the North Vietnamese Army (NVA) counter-attacked. James Livingston, a farm boy from Telfair County, Georgia, had originally planned to pursue a career in engineering after graduating from Auburn University. He envisaged himself hunting, fishing, and carrying on the normal life of a rural southern man. But as he was preparing to graduate in June 1962, he received notice from the U.S. government that his student deferment would be ending, and that he should report to the nearest military induction center for service in the U.S. Army. Vietnam was not yet in the news and service in the Army at that time most likely would have involved posting in Germany or Korea. Livingston went to the Marine Corps where likely duty assignments were Camp Lejeune NC, Quantico VA, or Albany GA. Quantico, the furthest from home, was only 550 miles away. Never intending to stay in the Marines, Livingston accepted a Reserve commission, as regulars were not given the $300 uniform allowance. Having impressed the leadership at Quantico, after graduating Basic School in December 1962 he remained as a permanent member, taking command of various training organizations until his assignment as Marine Detachment Commander of the USS Wasp. 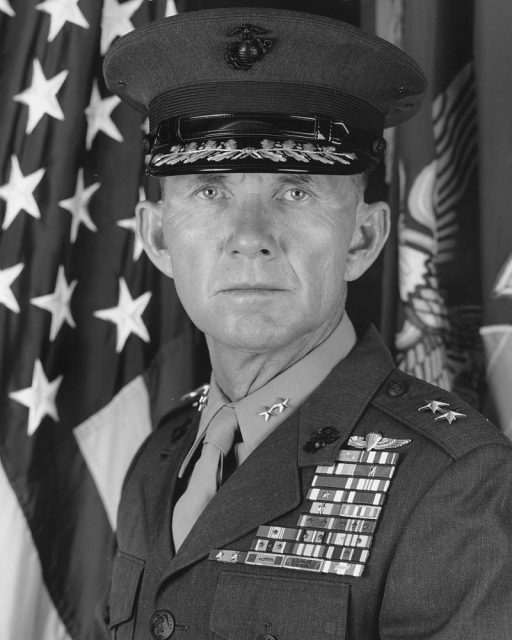 His subsequent assignment was to Vietnam in August 1967, where he assumed command of Company E, 2/4 Marines in the I Corps area of northern South Vietnam. Captain Livingston adjusted well to Vietnam. The climate was very similar to his native Georgia. He’d also been brought up in the rural south where manual labor on his father’s farm was expected, and major entertainments were hunting, fishing and the occasional basketball game. As a result, Livingston’s physical toughness was as apparent to his men as was his concern for their welfare. His slow southern drawl was a common and welcome sound. 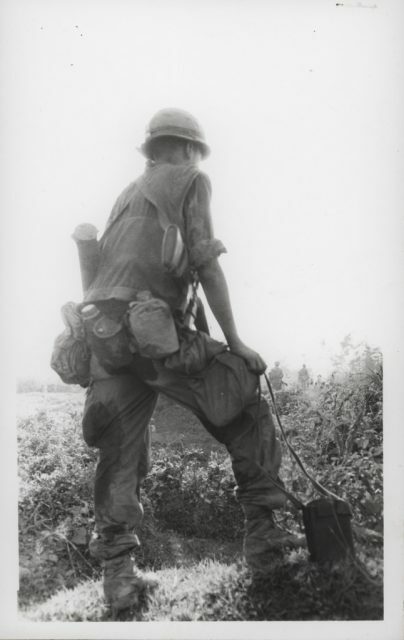 After heavy fighting in the Con Thien area along the Demilitarized Zone (DMZ), 2/4 Marines was moved a few miles south to the vicinity of Dong Ha. At the end of April 1968, Livingston’s E Co was detached from the battalion to guard the Dong Ha Bridge. His biggest problem there became the complaints of the battalion surgeon and his insistence that injuries be assessed at the company level. 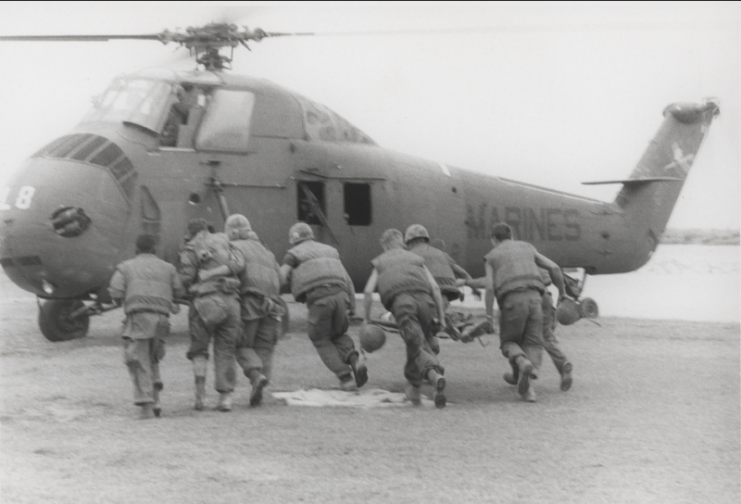 The newly published policy of “three Purple Hearts, or two in 48 hours” resulting in rotation home had caused a sudden increase in Marines seeking medical attention. Little did Livingston know that within three days he would qualify on both counts. 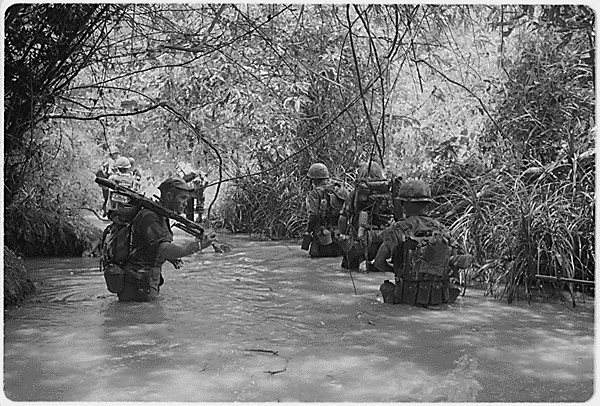 On April 30, the NVA 320th Division began an attack on the Cua Viet River. The river linked areas south of the DMZ, including the Dong Ha Combat Base, with Con Thien and the eastern DMZ posts manned by Marines. The 1st Amphibious Tractor Battalion and Navy riverine units provided transport and security along the river. 2/4 Marines reacted to the attack of the 320th Division, but two regiments of the division lodged themselves on the banks of the river and virtually shut it down to U.S. Navy traffic. Two U.S. Marine Corps Sikorsky UH-34D Seahorse helicopters on the runway at Đông Hà, Quang Tri Province, Vietnam, in 1967. A Boeing-Vertol CH-46 Sea Knight and two Bell UH-1 Huey helicopters are airborne in the background. Livingston rousted his lieutenants from their sleep and the platoon sergeants from inspection rounds along the banks of the river and the bridge control points. He ordered the immediate turnover of their posts to Army of the Republic of Vietnam (ARVN) troops and the non-infantry Marines of the Dong Ha Combat Base. Then he loaded his men aboard the vehicles of the 1st Amphibious Tractor Battalion. Moving down Highway 1 and along the river, Co E was in constant contact as they moved south. The NVA had forced the Navy patrol boats and transports off the river, and almost closed it to the Marines and their AmTracs. Arriving at his staging area after a protracted fight down the river, Co E found that Co G and Co H were trapped. 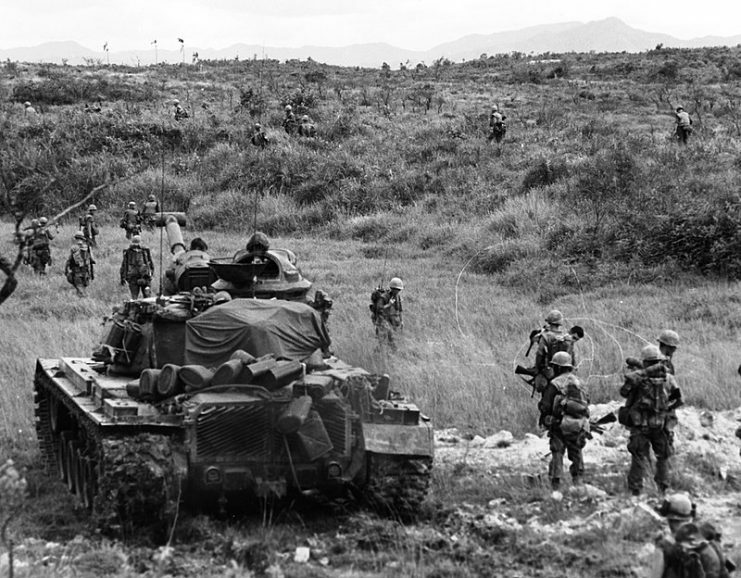 B Co, 1/3 Marines, sent to reinforce them, had been driven back. 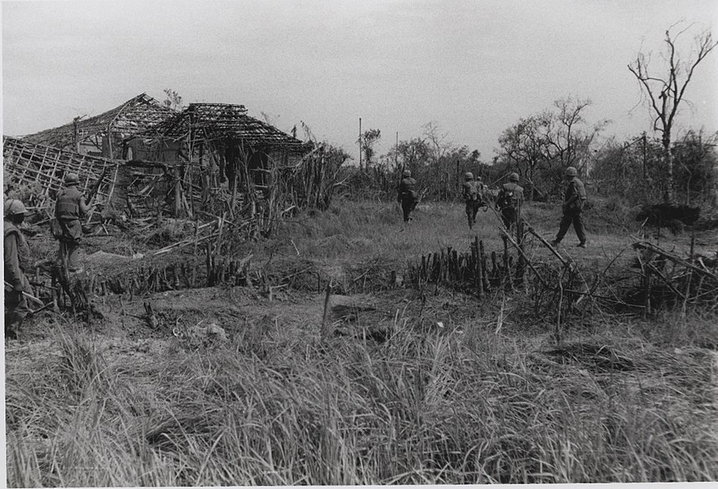 At 5:00 AM, the 180 Marines of Co E launched themselves ferociously across nearly 1/3 of a mile of open rice paddy in their determined attempt to reach Co G.
Throughout the morning, heavy machine gun and RPG fire was received, as well as torrents of small arms fire at distances so close that hand grenades were also liberally thrown by the NVA to staunch the rabid attack of the U.S. Marines. 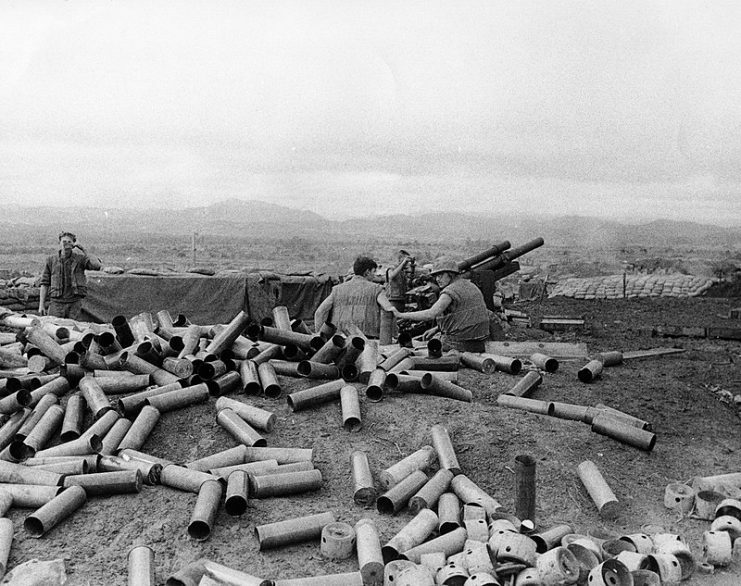 Steadily advancing under the cover of helicopter gunships, fixed wing close air support, and both artillery and naval gunfire, the Marines still faced daunting small arms fire. At times, the Marines gave in to their humanity and faltered. Livingston would appear and push them on, leading heroically and spurring the men on to the superhuman efforts Marines are known for. 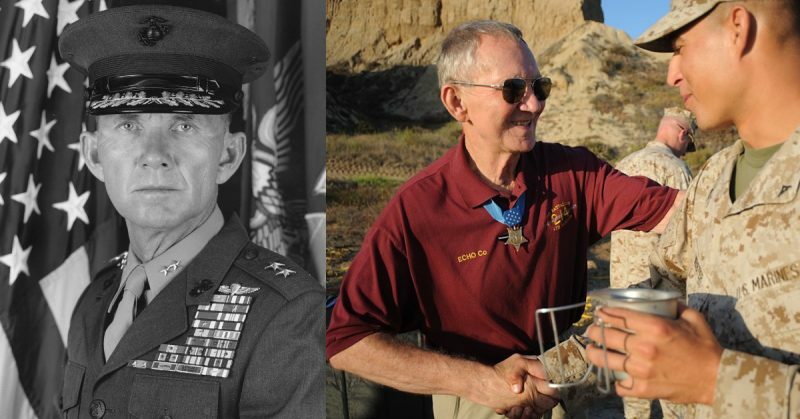 When his two leading platoons became pinned down by machine guns and began taking tremendous casualties, Livingston led his reserve platoon into the line between them. By sheer force of will, Livingston and his men broke through the enemy defenses and into the town of Dai Do. Methodically destroying enemy bunkers and defensive positions with hand grenades, satchel charges, and rockets, the Marines secured Dai Do. The cost was high: Livingston was struck twice by grenade fragments, and only 35 of his men were still fit for duty. Continuing to consolidate their hold on Dai Do and find more bunkers to destroy, the men of E Co exploited their moments of relative peace. Livingston was everywhere – supervising the destruction of enemy emplacements, comforting the wounded, and inspecting the defensive positions his men were building. He was also constantly on the radio. Calling for artillery fire, calling for air strikes, but most importantly, calling for the helicopters of “The Ugly Angels” to fly his wounded and dead to hospitals and aid stations aboard the ships of the Special Landing Force and the medical facilities at Dong Ha and Phu Bai. The UH-34 Seahorses of HMM-362 cleared their schedule and flew 132 medevac patients, reinforcing their reputations as the “angels” of the battlefield. 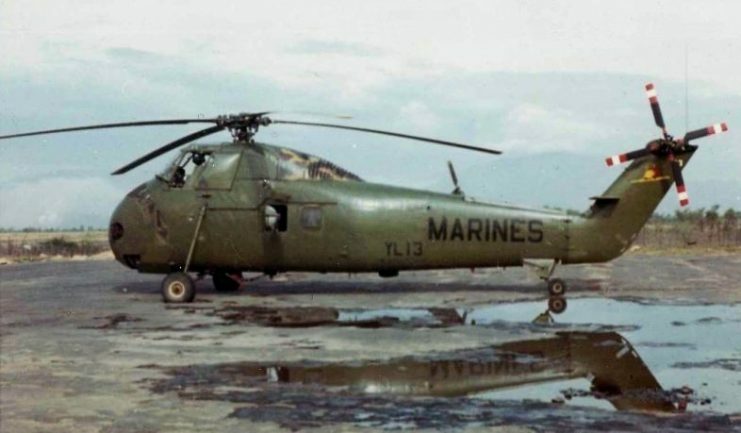 A U.S. Marine Corps Sikorsky UH-34D Seahorse from Marine Medium Helicopter Squadron HMM-362 in Vietnam. The UH-34D was called “Huss” by the Marines, due to its pre-1962 designation “HUS-1”. Holding in place as H Co passed through their lines and attacked the neighboring hamlet of Dhin To, Livingston and his men watched helplessly as those Marines ran into a buzz saw of intense fire from automatic weapons, mortars, and rocket propelled grenades. Seeing the attack sputter and then stall, with horrendous casualties thinning the ranks of the almost surrounded H Co, Livingston seized the initiative. Telling his remaining Marines “we gotta go help those kids”, he and his platoon-sized company ran into the fight again as H Co was being overrun. Livingston forced his way into the fight, pushing through and into the lines of the surrounding North Vietnamese, and relieved the pressure on H Co.
Just as the situation seemed to be under control, the khaki clad regulars of the NVA’s 320th Division counterattacked, decimating the surviving Marines of the two companies – now numbering only 70 effectives. Cajoling his men, directing fire, and calling constantly for air strikes and artillery fire, Livingston and his men were able to hold the line they had so recently formed when suddenly, Livingston was struck off his feet. Slammed in the leg with a 12.7mm anti-aircraft round, Livingston went down hard, and his men saw it. Bringing his rifle to bear on the surging enemy forces, Livingston ordered his men to withdraw. Unable to walk, or even crawl at this point, he told his men to leave him and that he would hold off the enemy if he was able. Rapidly firing his rifle to cover the withdrawal, and still calling for air and artillery support, he was suddenly jerked from behind. Two of his young Marines, unwilling to leave the leader that fought side by side with them, screamed at him “Hell, no, Skipper!” and roughly dragged him away from the fight, to the relative safety of Dai Do. 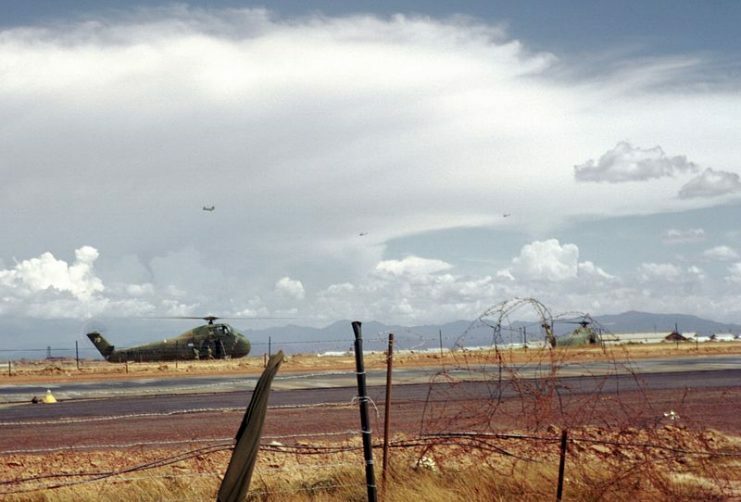 Beginning at 6:30 PM on the evening of May 2 and concluding the following morning, the helicopters of HMM-362 flew in more 1/3 Marines to relieve 2/4 Marines in the attack. The NVA largely abandoned their efforts to isolate the Dong Ha Bridge and silently departed during the night, allowing the 1/3 Marines to easily sweep through the bitterly contested towns and hamlets in the area. 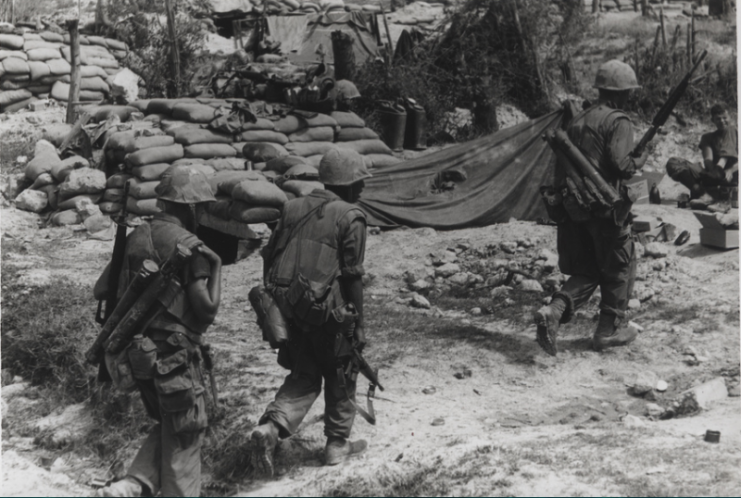 81 Marines were killed and over 400 injured, but the fighting effectiveness of two NVA regiments was destroyed through the relentless frontal assaults, the masterful use of supporting arms, and the dogged determination of the Marines not to be overrun. 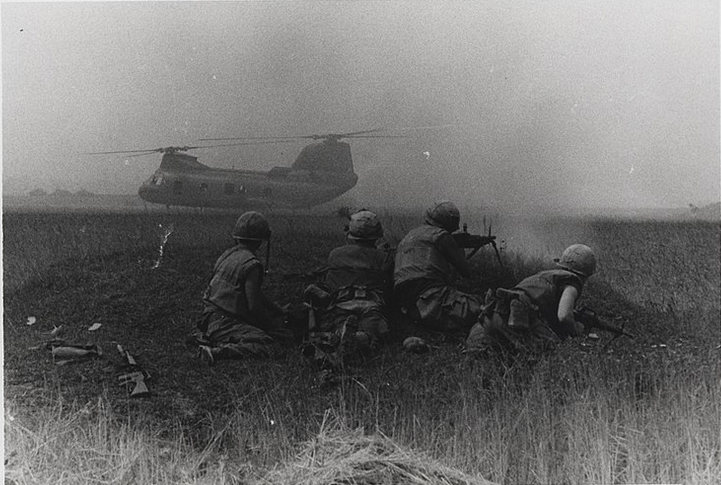 It is estimated that the North Vietnamese suffered over 2,000 casualties over the same four days that 2/4 Marines was ground down to almost nothing. The North Vietnamese were only delayed in their objective of taking Dong Ha. They would return to complete the job – but not until the U.S. Marines were long gone. 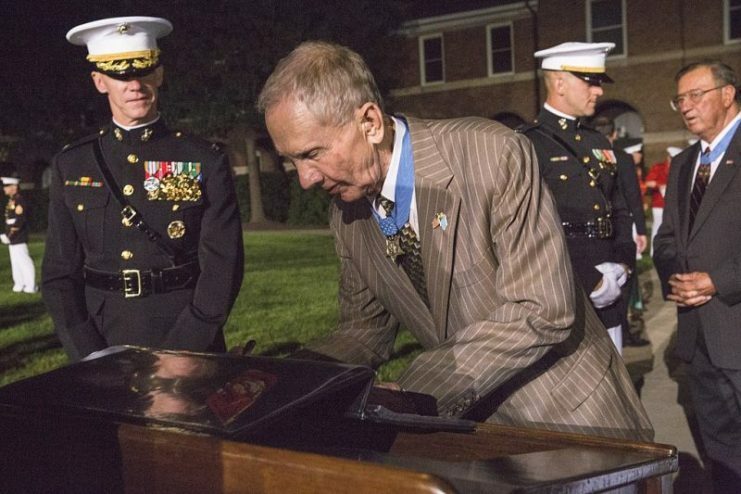 Retired U.S. Marine Corps Maj. Gen. James E. Livingston, Medal of Honor recipient, signs the guest book after the evening parade at Marine Barracks Washington, Washington, D.C., Aug. 5, 2016. Captain James Livingston qualified for return to the United States under either “two Purple Hearts in 48 hours, or three total” category. After his injuries healed, he instead returned to his Marines and departed Vietnam in November 1968. In 1970 Livingston was awarded the Medal of Honor for his actions on May 2, 1968.